A month has already gone by since Cosmoprof, the event of the year for the world of cosmetics for both professionals in the field and those who love the beauty business. Below are just a few of the testimonials from people who tried Imagea and who were pleasantly satisfied with this new product line. 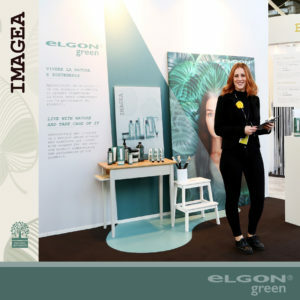 An important value that was transmitted was trust: with respect and safety for our health and the environment that surrounds us.In a market saturated with misleading claims, where many cosmetics companies claim that their products are natural and organic, Elgon is betting on its own transparency. Zero misleading information; only scientific facts about formulas with the utmost transparency. For example, the ingredients are among the features that make the Elgon Green line a favourite. Each product contains at least one certified organic ingredient and at least one ingredient derived from sustainable fair trade. These features are not just theoretical. They are stated clearly in the reference specifications called Mother Science. This is a sincere method for communicating our idea of more “ethical” cosmetic products without giving up performance and top quality results. We at Elgon Green thought that writing a set of production specifications would be the sincerest method we could use to communicate our natural choices to consumers.